If there’s one lesson that the members of Minibar have learned, it’s how to survive the music biz. The quartet’s latest album, Desert After Rain, blares with an all-on assault of rootsy melodies about heartache and rejuvenation. The band (vocalist Simon Petty, bassist Sid Jordan, guitarist Tim Walker, and drummer Malcolm Cross) moved from London to LA in 1998 in search of listeners that would appreciate their roots sound. They played a showcase in LA and were signed within two weeks by Universal Records. The major label signing was a dream come true for the band. Minibar’s major-label experience was short lived, but Petty gives no hint of regret. In 2003, the band released its sophomore album, Fly Below the Radar, on indie Foodchain Records. Minibar’s affiliation with Foodchain was also short lived. 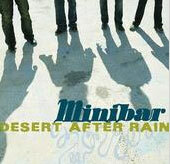 With 2007’s Desert After Rain, the band has taken back complete artistic control and released the album independently. The disk is being sold at shows and over the internet at cdbaby.com. The band is also receiving placements in film and television shows (The O.C., Nip/Tuck.) The loud, aggressive, kiss-off song, "Can I Call You a Cab?" was featured in an episode of ABC’s Men In Trees. “It was mixed so low, I couldn’t hear it the first time,” Petty says. As Petty says all of this, he points out that he is traveling in a van with his mates. Someone in the van is asking for cereal. “Malcolm, our drummer, likes to bring designer cereal with him,” Petty says. “To help him rebound in the morning,” Petty says. The guys have a pretty good spirit for being crammed into a van, traveling around the country. Perhaps it’s that “sheer bloody-mindedness” that Petty speaks of that landed the band an opening slot on Pete Yorn’s tour, and a gig working as both his recording band and touring band. In 2003, Yorn asked the band to record The Buzzcock’s "Ever Fallen in Love" on the Shrek II soundtrack. Since then, the band has been backing Yorn on his tours. This is Minibar’s second time in nine years playing in Philly. Odds are they might not be back in town anytime soon so don’t miss them. Minibar performs with Pete Yorn on March 17 at 8:30 p.m. at The Electric Factory. Cost is $20. Call 215-627-1332.